At the Day 4 dinner break, only 214 players remain. 12 players have broken the million chip mark, including Team Bodog member Jamie Gold (1.1M). Also past the 1M mark is William Thorsson (at right), who we’ve watched dominate play at his various tables since the start of the ME. The chip leader at the break is Alex Balandin (1.6M), who apparently is on a freaking tear again. 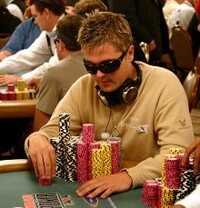 Kyle Bowker is still over a mil, stacked at 1.2M. Of the "name" pros, Annie Duke–a woman–leads them all at 704k. Allen Cunningham is still surviving at 465k, as is Humberto Brenes (450k). David Chiu’s had a rollercoaster day, and is back down to 365k. Defending champ Joe Hachem and Daniel Negreanu have been eliminated.